. 11th March, 2018 . Maybe you saw a WhatsApp Status picture or video that you really loved, and you want to share or keep it on your phone. 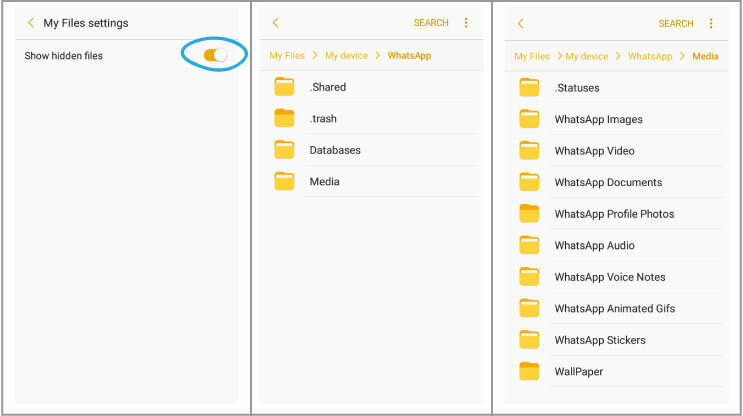 Good News: WhatsApp statuses are temporarily stored in a hidden folder on your device. You can save the pictures or videos by following these simple steps. 1. Open My Files app/folder on your Android phone. This 'files folder' name varies on various phones eg File Manager, File Explorer. If you don't find one, download one (eg. ES File Explorer) from Play Store. 3. Select Settings, you should see Show hidden files, tap it to enable "show hidden files"
Note: WhatsApp Statuses are available for only 24 hours. Remember to save them while they are available. Don't miss any of our Tips and Giveaways, Sign up to our newsletter!